Over the years, the question of how many computers per student or per classroom has emerged as a pivotal issue. Advocates for different perspectives agree that technology-enabled learning is important and the ideal is one-to-one computing and anytime, anywhere learning. In today's economic environment, school districts must budget wisely and get the most out of each dollar invested. 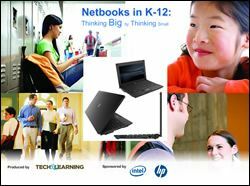 One way to address student computing and anywhere anytime access is with netbook PCs. This eBook will explore the issues and showcase districts that have implemented successful and cost-effective programs.